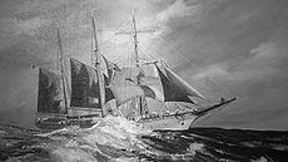 A proud product of the Buffalo shipbuilding industry, this beautiful schooner was launched just before the Civil War in 1855. With her svelte design and length of 130 feet, she cut through the Great Lakes waters like a sharp knife through warm butter. Sadly, just over a decade later, in 1866, she was lost in a collision with the Bark of the Baldwin during a time of low visibility and incorrect navigation. At the time of the incident, the Winge of the Wind was only a short six miles northeast of the mouth of the Chicago River. Luckily, the crew was able to escape in her yawl before the Wings went completely under. Now she rests at 40 feet, a tribute to the beauty of an era of sleek sailing vessels. With her shallow depth, she is a sight to see for new and experienced divers alike. We visit the Wings of the Wind from hammond Marina.